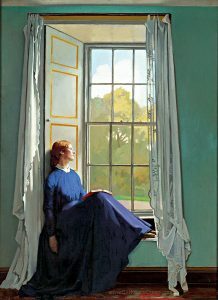 The Window Seat by William Orpen (1901) with a current photo of same location. The Window Seat by William Orpen (1901). Medium : Oil on Canvas . Size 30 x 22 inches. Grace, the artist’s wife, in blue dress, seated on a window seat in Arthur Herbert Orpen’s holiday house, at Lisheen, County Cork, (between Pierson’s Bridge and Kealkill, Near Bantry) Ireland in September 1901, when on their honeymoon. She has a book on her lap and seems to be in a state of reverie looking out of the window. Provenance : Anita Bartle, (Purchased in 1902 with a series of 12 weekly payments totaling 20 Guineas (11 at £1. 15 Shillings- and 1 at 15 Shillings). Haslam, Robert H. (By 1933); Gifted to family of present owner; By descent to present owner. Exhibited : London, New English Art Club, Winter 1901, 27th Exhibition of Modern Paintings, No.130. London, Royal Academy, 1933, 52nd Winter Exhibition, No.132. Liverpool, Walker Art Gallery, 1933, 61st Autumn Exhibition, No.179. Manchester City Art Gallery, 4 April – 13 May 1933, Works by Orpen, McEvoy, Ricketts, No.60. Literature : “The Speaker”, 30 November 1901, Review of New English Winter Exhibition. Arnold, Bruce, “Orpen: Mirror to an Age”, Jonathan Cape, London, 1981, page 104. 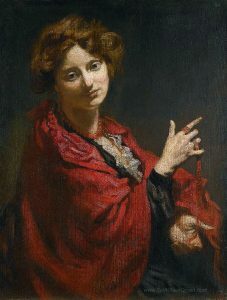 Anita Bartle – The Red Shawl by William Orpen (1905). Anita Bartle and Orpen became good friends, and in 1905 he painted two portraits of her, one of which he gave her on the occasion of her marriage the following year. She also wrote a book, “This Is My Birthday”, Stanley Paul & Co, Cliffords Inn, October 1902, which had quotations for each day of the year, with a blank page opposite. On the page opposite the William Orpen page of November 27 (page 664), in her own copy (Tate Archive), Orpen drew a self portrait, dated Jan 9th 1903. [See Christie’s Sale Catalogue, 23 June 1994, no.165]. “This Is My Birthday” by Anita Bartle with Self portrait by William Orpen. 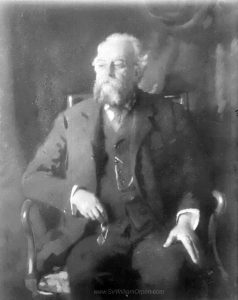 Orpen painted William Haslam in 1908, and his portrait along with the present work was exhibited in the retrospectives at the RA and Manchester in 1933 (then deceased), by R.H. Haslam. It is possible that Haslam may have acquired it through the artist about the time his portrait was painted in 1908. 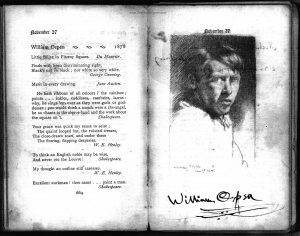 Black and white copy of William Haslam’s painting by William Orpen (1908). The Window Seat picture expresses Grace’s temporary sense of alienation in Ireland, her occasional bouts of homesickness, heightened perhaps by the recent wedding arrangements, and having to act as artist’s model – something for which she did not care. She wrote at this time – “We are having a very pleasant time – everybody is most kind – but I sometimes get a fearful dose of homesickness and feel I must fly straight off to Papa – it is almost overpowering while it stays”. Perhaps she would be even more depressed at the sight of the same location now! 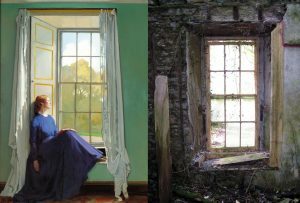 Then and now – Orpen’s 1901 painting juxtaposed with a recent photo of the same window. 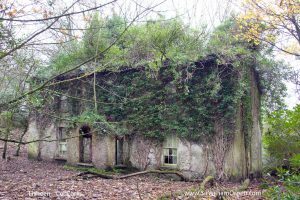 A recent photo of the exterior of Lisheen House, Co Kerry by Priory Studios. The window on the right is where William Orpen painted his wife Grace in 1901. William Orpen’s ‘Albert Rutherston with model’ and ‘Bearded Man’. Portraits of William Orpen, his wife Grace and mother Annie Orpen at Christie’s London. A poem by Oliver St John Gogarty to Kit Orpen – age 6. Costume studies 1 & 2 for ‘The Carnevale’ attributed to William Orpen (1927). The Poet by William Orpen (with Sean Keating).